W hat I Love: My 9-year-old son loves Legos and always says he wants to be an engineer, so I thought this would be a way to combine his two interests. 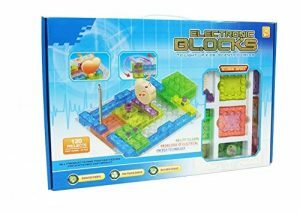 The kit comes with 34 different colored pieces that contain electrical components and a magnet. If you connect them in certain ways, you can build a fan, flashing lights, buttons to switch things on and off and music through the speaker. Although the package comes with a booklet that uses illustrations to show kids how to make more than 115 projects, my son had fun figuring out how to connect things to make them work on his own. I love the concept of adding working (but safe) electrical circuits to simple building blocks to encourage STEM-based fun! What I would change: The directions seemed a bit difficult to understand, so perhaps simplify them.